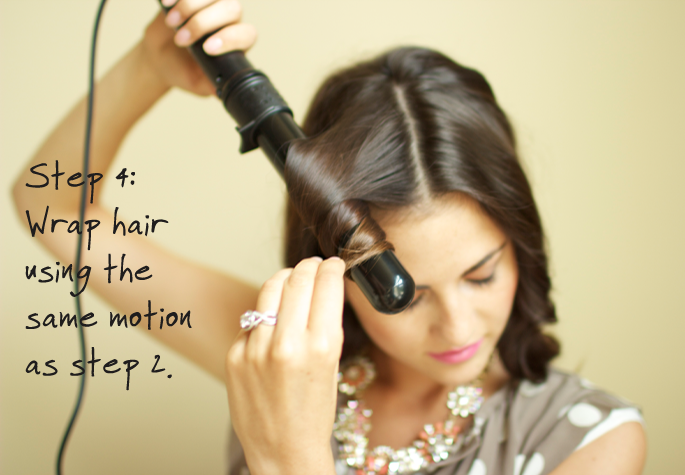 For a more curled look: Leave the iron your hair longer, curl the tips and hair spray right after. Im going to give this a try!! Thanks! 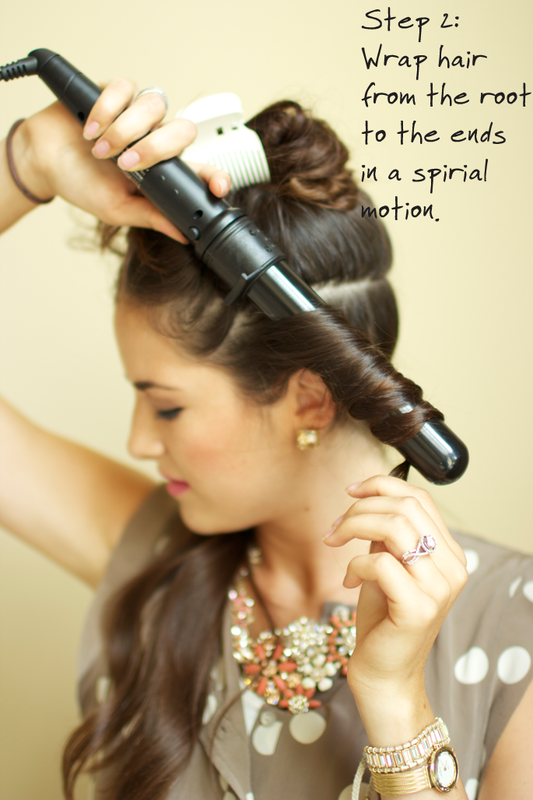 I have been having the hardest time curling my hair – I will try this tutorial tomorrow, you make it look so easy!! Love your hair always fabulous! Thanks for the tips. Awesome tutorial! I always like seeing how other people curl their hair! Definitely bookmarking this page. Thanks for the tutorial! your hair always looks so gorgeous! great tutorial! bellissimo il risultato dei capelli .. l’outfit giallo è stupendo .. i pantaloni sono bellissimi!!! Your hair is so healthy & long! This is exactly how I curl my hair as well. Except, I do it in uneven sections for a messier & random look! CUTE! Thanks for the tip! I have never curled my hair with curler pointing down. Thank you for posting this tutorial! Your hair always looks so lovely, I’ve been wondering just how you do it! Beautiful! I dont have this exact curling iron but one similar and I love it. Best invention ever! Make curls turn out so good! I am definitely getting this iron! Thanks for the tutorial! Could you please share the exact size barrel you’re using here, since that can have a big difference? Thanks. I forgot to add…what size iron do you like??? Great tutorial! I will have to try curling down like that! Such a good tutorial! Your curls are always perfect! I love those pants! Where are they from? I love your blog. Great tutorial! Your hair always looks amazing. :) And I love the floral pants in the last picture! Great tutorial! I curl mine with a straightener but am thinking about getting a barrel like this! I was so hoping to purchase this curling iron after I saw your tutorial! It’s not available on the HSI website. Can you purchase it at any stores? Thank you! Thanks for the tutorial, your hair always looks great! Yay, you did it!! Great job! Love your blog! :. I’ll definetly follow and come back soon :). Come by my blog is you want too and follow :). I just started blogging yesterday :). Wauw, wish I had your hair.. I have a question for you. My clothing budget is very tight, as is my closet space. In the past if I had some clothing money I’d just buy something because it was VERY on sale and then hate it after a few wears. Now I’d prefer to save up my money and buy only some good pieces that I love, even if it means I will have very few clothes. Anyway, my question to you is if you were in my situation, what items would you HAVE to have in your closet. What are the workhorse pieces that you love that can be worn again and again in different ways? I am also curious about jewelry too, I can’t afford to always buy the trendy fun pieces, but what are a few classic pieces that I can wear with everything. Thanks! Every time I read your blog I want to dye my hair dark again. Cute tutorial! 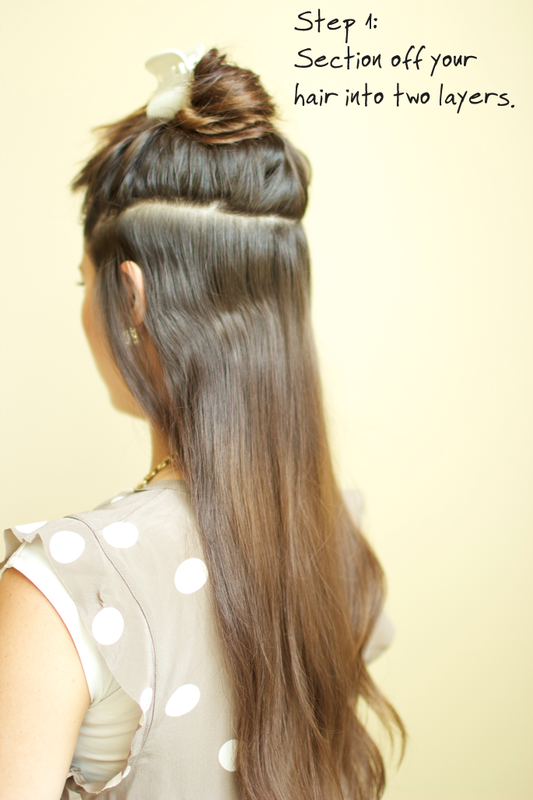 Tried this on my hair today, it turned out great! I saw you on studio 5 the other day and now I’m obsessed with your blog. So glad to have found you! love this look. I need to recreate it for my bridal shower, so I need to buy a curling rod soon! Wow, this is great. Thank you! I think I learned something here…even though my hair is a bit shorter than yours, I think I will try the loose curls. I have short hair and never curled my hair… Maybe I should try it! Is there a particular reason you hold the curling iron like that? Perfecto! Exactly what i need – someone to show how to make the hair. Let’s see if i manage to make some curls! I NEVER THOUGHT ABOUT HOLDING THE IRON DOWN! GREAT TIP! Love seeing how other ladies do their hair and can’t wait to try curling with the iron pointed down the whole time! Thanks for sharing! 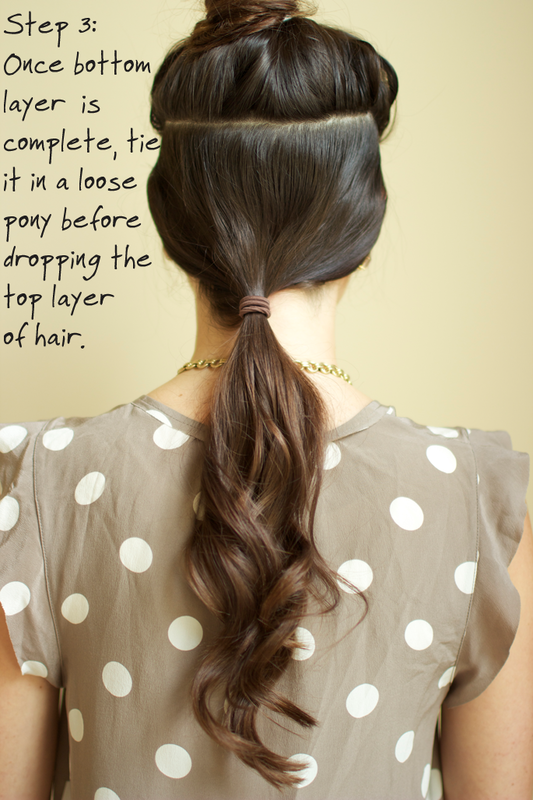 your hair ALWAYS looks amazing – – so thanks for sharing the tip! And I’ve been needing a new iron! gorgeous hair!!! love love love your blog! Thank you so much!! Your hair is so gorgeous! Mentioned you on my blog today! Where is your polka-dot shirt from? Love your hair. Great tip on the wand pointing down. Will have to try that next time. Thanks. 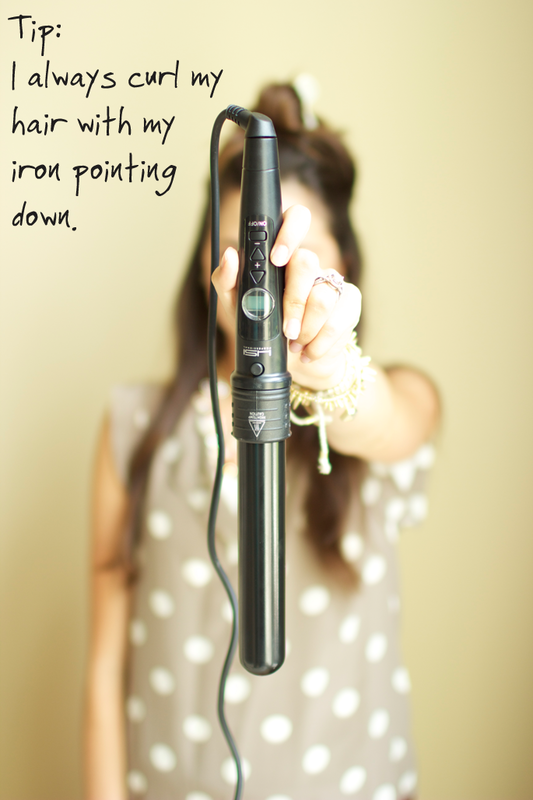 What size curling iron do you use? Would lOve to see more hair tutorials!